Smoking is the single most important preventable cause of mortality and morbidity. Approximately 75 % smokers express their desire to quit smoking.Half of them (33 % of total smokers) go on to make a quit attempt each year but only a small proportion of it - about 5% - quit smoking successfully. Just like many other addictions most smokers think that they can stop smoking without any help.But a number of studies suggest that Smokers who quit smoking with specialist support and medication are up to four times more likely to successfully quit and remain abstinent compared to smokers who stop without any professional help.This means stop smoking services are quite effective and they deliver life saving interventions by preventing adverse consequences of smoking. A lot of people think women find it harder to stop smoking than men, this is not normally true. Men and women find it equally difficult to quit smoking. However, women are more likely than men to access stop smoking services. Smoking is the primary cause for millions deaths worldwide, and results in the early death of 50 % of smokers who do not quit smoking. Smoking is the cause of long-term illness and disability in many smokers, including those that ultimately die from something else other than their smoking. Quit smoke smoking Cessation Programme is a programme designed to help people who want to get rid of habbit of smoking.It can also help people using tobacco in other forms like gutakha,khaini etc. Its an out patient treatment programme and hospitalization is not required. Each smoker is an individual with a unique tobacco-use history,personality make up and lifestyle r and our proramme is customised to individiual requirements. Lung cancer-The risk of lung cancer is 15 times greater for a smoker than a non-smoker. The risk accumulates over time and is directly related to daily cigarette consumption and how long someone has been smoking. About one in eight smokers who do not quit will die of lung cancer. Cardiovascular disease (such as heart attacks and strokes) is responsible for around 25 % of all smoking-related deaths. The average smoker has double risk of having heart disease prematurely compared to someone who has never smoked, and even light smokers have increased risk of developing cardiovascular disorders. In this disease the lungs lose their capacity to transfer oxygen to the blood. Around 20 % of deaths related to smoking are secondary to COPD. COPD is easy to detect at an early stage through spirometry (a test to measure lung function), and stopping smoking is one of the most important intervention to prevent its progress. 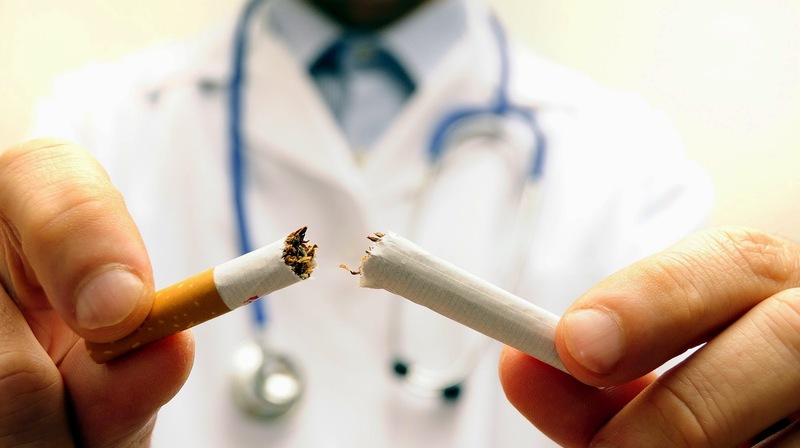 -Smokers undergoing surgery are at an increased risk of complications from anesthesia -Smokers are more vulnerable to post-surgical complications and delayed wound healing. It can be motivating for smokers to have information on the benefits of stopping.For smokers that quitting is the best thing they can do for their current and future health. It is important for young smokers to realise that they have most to gain by stopping now. Stopping smoking increases life expectancy at every age but the earlier the smoker stops the better; quitting at age 35 adds an average of 10 years, while quitting at 65 adds 3 years of life. Stopping smoking at any age will lead to improvements in physical and mental health. The risk of lung cancer stops increasing when smokers stop smoking. The increased risk of heart disease diminishes by 50% within the first year of quiting smoking. Ex-smokers report being healthier, happier and having greater life satisfaction than smokers. The average smoker saves over 40000 to 80000 Rs. per year if they quit.